The , and already we’re longing for one. Call it love at first sight. The 780-hp, 6.3-liter V12-powered hypercar looks, in a word, stunning. There’s simply nothing else that looks quite like it. It’s pure emotion. For anything that looks like the Apollo IE, a glorious engine sound is required, and this thing doesn’t disappoint. Apollo recently uploaded this short but fun video of the new Apollo IE testing at the Cremona circuit in Northern Italy. Yeah, we know the short clip isn’t of the highest quality, partly due to the car testing at night, but Apollo claims the IE is testing below 4,000 rpm at light throttle, and yet it sounds brilliant. Apollo proudly says it opted to avoid any sort of “emotionally dilutive technological systems, specifically hybridization and turbochargers. No, this 6.3-liter V12 comes courtesy of Ferrari, specifically the F12 Berlinetta. It has a redline of 9,000 rpm. Enough said. Apollo claims the IE weighs just 2,755 lbs. and has a 45:55 front/rear weight distribution. 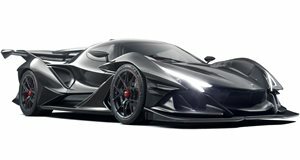 Only 10 examples of the 200 mph+ Apollo IE are planned at a cost of $2.7 million a pop. It’ll be money very well spent.